The "last phone you'll ever need to buy" won't be available for you to buy anytime soon. 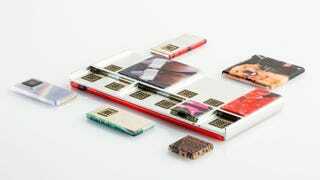 Google says that the super exciting Project Ara modular smartphone will launch in... Puerto Rico? Yep, the United States island territory will be the first place you can get the crazy smartphone when Google launches a limited market pilot later in 2015. The January 2015 release date we heard earlier is sadly just for developers, as Google plans to ship big barebones dev boards to them later this month. We also don't know how much the final version will cost or precisely when it'll get there, but Google believes it'll feature 4G LTE connectivity and at least a day's worth of battery life by the time it hits Puerto Rico shelves. It will have a new endoskeleton that can route cellular signals to more efficient antennas, and inductive wireless connections for each module instead of using spring-loaded pins. Google hopes to have 20-30 modules ready by then. Google's cautioning that the day of battery life might require swapping out batteries in the middle of your day (!) but also may already have a solution: battery technologies that have traditionally been shunned by phone manufacturers because they can't be charged as many times as normal cells, but have many times the energy density. The charging issue isn't as big a problem here (I guess?) because the batteries are totally modular. Why Puerto Rico? Take a peek at Google's slide above, but in case you can't read the small text, Google says that Puerto Rico has a very diverse population of smartphone users, lots of carriers, is a "gateway to the world" as far as the internet is concerned since it's a junction point for underwater cables, and also benefits from having same-day shipping anywhere on the island. Oh, and it's got some designated free trade zones that Google is eyeing carefully. That said, this is just the market pilot: a full launch of the Ara device could be farther off, or perhaps not even happen at all. "We don't know the answer to that question," said Google ATAP director Regina Dugan, when asked how long it might be between the market pilot and a full global launch. See the roadmap above? We're only at the Spiral 2 phase right now. Traditionally, Google ATAP's skunkworks mission is to turn advanced technology into real products within two years, or else move on, but Dugan say earlier today that this project might be the exception to the rule: ATAP might take "another two-year swing at it" as long as they know why their efforts failed. How will Google sell Puerto Ricans on Project Ara? Food trucks. It's going to turn some food trucks into mobile stores, and roll them around the country while providing live demos. You can follow the ongoing Project Ara Developer Conference livestream right here.